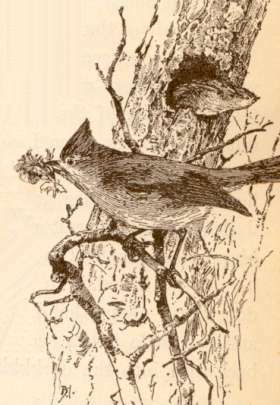 Oak titmice are about five inches or a little longer. Gray forehead extending up to a conspicuous crest. Dark gray back, wings and tail. Dull white under parts. Like the rest of the Paradae family, they forage trees and thickets in flocks for insects, seeds, nuts and fruit. Sometimes they catch insects on the fly. Oak titmice build nests of fine grasses, feathers, hair, fur and moss in natural or abandoned cavities. They usually nest in oak trees and also in out-building nooks and crannies or bird houses from near the ground up to thirty feet high. Females lay about five to eight white sometimes speckled eggs. Young hatch after about two weeks of incubation and leave the nest in about another three weeks. Early ornithologists who removed parents from nests for research discovered their fierce resistance when being invaded. They would even return to the nest while the researchers were inspecting their nests. The Oak Titmouse Birdhouse (same as for Tufted Titmouse, Nuthatches, Downy Woodpecker and Chickadees) has a 4″ by 4″ floor, 9″ inside ceiling, 1 1/4″ diameter entrance hole located 7″ above the floor and ventilation openings. Assemble with corrosion resistant screws fit to pre-drilled countersunk pilot holes. Secure a hinged roof with shutter hooks for easy access. Mount nest box on a tree trunk in forest edges or groves from chest level to just out of reach, higher if necessary. Remove the nest and clean well after the brood rearing seasons are over. Chickadees and nuthatches may use this box. Builds nests of fine grasses, feathers, hair, fur and moss in natural or abandoned cavities, often in oak trees and in out-building nooks and crannies or bird houses from near to the ground to thirty feet high. Lays about five to eight white sometimes speckled eggs which hatch after about two weeks of incubation and young leave the nest in about another three weeks. Mount nest box on a tree trunk in forest edges or groves from chest level to just out of reach, higher if necessary. Remove the nest after the brood rearing seasons are over.